Less than nine months ago, scrubber advocates were asking why uptake of the technology was so low when the economics were so compelling. Today, a vocal and growing number of skeptics are questioning whether IMO should ever have allowed their use in the first place. Clouding the debate is the fact the both sides stand to gain financially from their respective positions. The core argument from sceptics is that not enough is known about the technology's long term environmental impact. This is a view seemingly backed by recent bans on open-loop units by high-profile ports including Singapore and Fujairah. But scrubber-sceptic shipowners who have opted not to invest in them also stand to gain commercially should their scrubber-equipped peers suffer a u-turn on the technology's acceptance. It is a factor highlighted by J.P. Morgan analyst Noah Parquette, who during Thursday's earnings call with DHT Holdings noted the changing attitude on scrubbers was "accelerating pretty quickly" and asked if the debate would be scientific or "just sort of a fear mongering." "People have different reasons for doing what they're doing or thinking what they're thinking," said Co-CEO Svein Harfjeld. "I think from a ship owners perspective, there's sort of two camps that are against scrubbers. Either ones who haven't got the money to do it, or the other camp that sort of came way too late for the party to do this in a credible and realistic fashion well ahead of the 2020 timeline." Harfjeld, who made it clear that the recent bans have no impact on the economics of his firm's scrubber strategy, also suggested the bans were expected as it was "politically correct" to implement them "without necessarily having a scientific base to back up that position." But it's not just the sceptics' motives being called into question. Owners and manufacturers of the technology advocating for its use insist there is no evidence to suggest it is harmful to the marine environment. Of course, it is easy to say that having already invested millions on the tech in good faith based on IMO guidelines, they only stand to lose by taking any other position. Still, the core message from advocates is scrubber-equipped tonnage can gain a significant commercial advantage because in the post-2020 market they can continue to buy and burn what is projected to be significantly cheaper HSFO bunkers. This, say the sceptics, will not hold true come 2020. "I think that the promoters of scrubbers, and I use that term deliberately because I think it's not just analysis, it's active promotion, have been advertising the spread between MGO as a proxy for compliant fuel," Euronav CEO Paddy Rodgers, who as emerged as one of the more outspoken voices against scrubbers, said last October during his firm's Q3 earnings call. "I don't think MGO is an adequate proxy and certainly we saw the Chinese saying that they thought that the spread would be no more than half the [HSFO-MGO] spread. So already the promoters' view of how much you could make from having a scrubber has been half and yet that's received virtually no commentary." 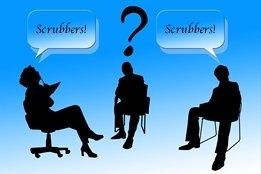 With the war of words on scrubbers having been so far limited to the media and industry events, the debate will now move to IMO level with the matter set to be discussed at PPR 6 later this month and MEPC 74 in May. The global 0.50% sulfur cap on marine fuel comes into force from January 1, 2020.